Director Klay Hall and Producer Sean Lurie have worked on several children’s films including two Rugrats Movies, The Wild Thornberrys Movie, We’re Back: A Dinosaur Story, and recently Tinker Bell and the Lost Treasure. They talk about their experiences. 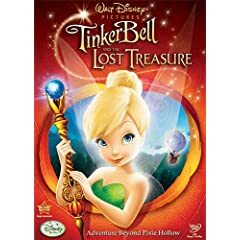 Klay – We are so proud of Tinker Bell and the Lost Treasure because not only is it great entertainment for the whole family, but the message in the film is about friendship and forgiveness and that ultimately, no matter what, friendship is the greatest treasure of all. Sean – It also has some good laughs which we think parents will like. Klay – As fathers of two kids each, we know from experience that being a close family and sharing as many experiences as a family, even as simple as a ball game or a board game, is vital. Sean – We listen to our kids and support their dreams and have learned that sometimes that’s all they want. Sean – One of the best things dads can do is to practice what they teach. If we tell our kids to be honest, we should be honest. If we tell our kids not to gossip, we should not. We like to be positive role models and follow through on promises and commitments – that has made such an impact on our kids – to be accountable, honest and most importantly – present. Klay – We couldn’t agree more. Making family a priority, even when it conflicts with work, is meaningful. We recently flew a red eye in and out of an important work function to maximize the time we spend with our kids. They almost didn’t notice we were gone, the turnaround was so quick! Sean – Kids need balance. They need to learn that they can’t have everything that they want, when they want it. It’s not the way life is. We have been fortunate in our lives not to have seen truly rough times, so it amazes us every day to see kids integrate certain values into to their daily lives such as environmental awareness. Sean – Showing love and accustoming kids to hardship are not mutually exclusive things. One might argue that teaching kids that things are not always easy is an expression of love. Showing affection to children is important, regardless of the lessons you are teaching them. Klay – Call us softies, but it goes without saying that we like to err on the side of love.